Apples Magic Mouse looks like the final solution for mouse noise. Wish I could get one for PC. I just got one myself for my PC. Overall works good but I miss not having a middle button. Maybe they'll eventually update the windows driver to give you more options such as a two finger click for middle. But for noise, it's not as quiet as you might think. It still has a "click" for the button. Just like the other apple mice, the whole mouse clicks down as one big button. As opposed to using the touch pad part of it as a tap-to-click like on laptop ones. And the click isn't silent by any means. But it is nice to not have any noise on the scrolly wheel being that there isn't one. I always liked the scrolling on track pads better than mice wheels anyways. Post subject: Re: Recommend a Silent Mouse and Keyboard? Are you good with a screwdriver? I made a new logitech nearly completely silent (the video shows the difference between the right click and center click button). I was tired of waiting for the market to meet my need, so I hacked. The scroll wheel has a silent factory featured silent mode, called hyperscroll, so the mouse is not the quietest mouse I have ever used. Okay, I've used the Apple Magic Mouse for one day (so far) and it still clicks (though relatively quietly?). The touch functions to differentiate between the types of clicks: left, center, and right, and the area around the Apple logo stem. You can also do a 2, 3, and 4 finger click. You can do a scroll with a single finger swipe (with momentum in Snow Leopard), and you can do Forward and Back browsing with 2-finger swipe to the right and left, respectively. You can do a 3 finger swipe -- the 4 finger swipe is possible, but not really practical on a mouse (whereas it works fine on a touchpad). So there are how many different functions? 3 single finger clicks, 3 multi-finger clicks, single finger swipes for horizontal and vertical scrolling, 2 finger swipes for Back and Forward, 3 finger swipe for program scrolling, (4 finger swipe is silly). The only 1 finger tap (a momentary touch, without depressing the click!) that is practical is the Apple logo stem area -- 1-4 finger taps are possible, but very tricky to control; so they are probably not practical, either. That's makes 12 usable functions, by my count (and that counts both directions of scrolling as one, and Back and Forward browsing as one!). To get all these extra settings, you need to download the Apple program called MagicPrefs. You can use logitech mx5500 revolution keyboard. It is quite silent and comfortable and it also runs on bluetooth technology. In sile\nt mouse so you can choose Thanko Silent Mouse. It is the best option for mouse. Today I modded a Microsoft Wireless Mobile 3500 mouse to be pretty darn quiet. This mod is really crude and low tech but I've done it on 2 MS mouse models and it works. Like with any mod, there is a chance you'll wreck your mouse, be aware of that before you start. You are probably familiar with the sharp click of MS mice. That is because of the switches MS uses under the buttons. The switch is a little box under the button with a little circle on top. The button depresses the little circle on the switch. The circle pushes down on a little circular rubber plunger. The plunger pushes down on a circular metal plate. The plate bends, like if you've ever pressed on a thin metal panel. It buckles and then returns to its normal form. This is what causes the sharp click. In this mod you take apart the mouse to expose the switch. Obviously unplug the mouse. MS hides the screws under smooth plastic patches on the mouse bottom. You pry those off with a knife. They have enough glue on them that they should stick back on afterwards. Now if you're lucky, you have normal screw heads that you can use a normal mini screw driver. Unfortunately MS is using more uncommon screw types these days to make it even harder for you. On the model 3500 there's a hex head. I have some small metric and imperial hex keys, and none of them matched this darn head. But the game isn't over because as far as I'm concerned, I'd rather destroy this mouse than use a loud mouse. If you can't open it the proper way, just pry off the top plastic part with the buttons. This should expose the switches. Yes this will potentially break some of the mouse body but both mine were OK.
Then you pry off the TOP of the switch. NOT the whole switch, don't pry that off the board. Just the top with the little circle on it. There's no nice way of doing this AFAIK. The top is going to get a little busted, but it should still fit afterwards. You need that part, so collect it if it goes flying. It's best if it stays partially attached to the switch body but that's a matter of luck. You take out the circular button and rubber plunger. You should be looking at a shiny circular metal plate on the bottom. Leave that in there. You can try pressing it. It still makes a clicking noise, but a lot less without the rubber plunger. Your mouse will actually work just like this if you plug it in, but I don't recommend that because there are capacitors exposed and stuff. You don't want to be touching that LOL. Now...bear with me...take a thick wooden matchstick or other piece of wood about that size. Get the switch top part that you pried off. Use pliers to lightly squeeze the matchstick until it fits in the circular hole in the top part. If the bottom of the match isn't flat, use a file to gently make it flat. Put the top part back on the switch. If you play around with it, it should hold on at least one of the tiny pegs it broke off. It doesn't need to be perfect. Worse case scenario you could glue it back on. Insert the flat bottom of the match into the hole. If you press down, you should notice the clicking sound is considerably less. Now get some wire cutters, or a sharp knife, and cut off the match just above the level of the top part. If you look at the other mouse button, you don't want the match to be sticking up much higher than that. Now put the big plastic button plate back on top. Probably the button with the matchstick will not even move. That's because the match is sticking up too high. You can try filing down the match, or also filing down the plastic nub on the button that makes contact with the switch. Don't go too crazy or you might file too much. Test as you go. Again if you try this you may permanently bust your mouse, but I'm 2 for 2 so it works. Can anyone recommend a good silent keyboard with proper F keys? The Microsoft ones are nice to type on (I like the low impact laptop style keys) but they tend to have stupid F keys. They are either too small (why not make them normal size?) or they have different caps on them with the F1-F12 printed above them in a low contrast colour. Sometimes they attach the F keys to the main block of keys as well which isn't ideal either. Logitech do some with normal F keys but I don't like the cheap feel of their reasonably priced models. Are there any suitable ones? Some of the IBM/Lenovo keyboards with Thinkpad style keys look good but are quite expensive. I do love Thinkpad keyboards though. I have seen a few Seitek models that look okay but have been unable to try them out. 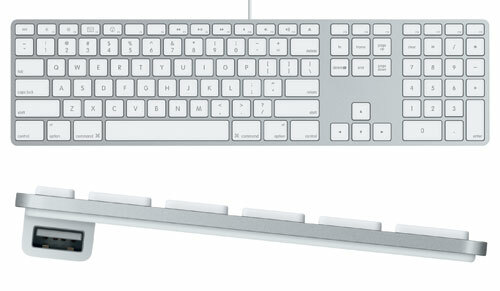 Did anyone mention the Apple aluminium keyboard yet? Even though I'm not a big fan of Apples other hardware (too expensive, not flexible enought) the keyboard is something I like. It has keys like the ones on a laptop; not totally quiet but a lot quieter than most keyboards. Decent rubber pads on the bottom also help to dampen the sound. In fact, at school we have a classroom full of these things and you don't really tend to hear them that much. I tried the Apple keyboard out for a couple of hours and was not very impressed. I think the problem is mainly lack of travel on the keys. The spring in most keyboards pushes your fingers back up... It's a bit like walking where every step springs your foot back up and forwards a bit. It also felt a bit cheap, but then I have found many Apple laptops and laptop keyboards to be that way so it might just be my aversion to their aesthetic design. Silver titanium looks the worst but I think these keyboards are made of aluminium which looks a bit less plasticy. Oh, and it doesn't have a number pad so it isn't really very useful for office/programming tasks. It's more of a casual keyboard I think. How well does it work with PCs? It will work via Bluetooth but can you access the BIOS with it? The keys not having as much travel is the price you pay, even though I think it's actually pretty nice if you get used to it. It's a bit awkward at first, but I guess faster typing is possible exactly because the travel isn't that big. You don't have to move up and down as much, therefore, you type faster (in theory that is at least ). On the construction front I feel it's pretty solid. That has a lot to do with the solid aluminium slab it made out of. The keys are light and of course, plastic, but I fiddled with them a bit trying to pull them loose and I didn't succeed. Personally I feel the build quality feels better than most keyboards out there, even the higher-end ones. That might have to do with my fondness of 'real' materials and in this case aluminium especially, but I do like it. It has a nice, heavy but not too heavy quality feel to it. You can see the keyboard comes with a numpad. Not sure if they carry this one in a wireless configuration, can't seem to find it just now. At the moment, I don't actually own one of these keyboards, but I work a lot with both the wired numpad keyboard and the short version at college. Pretty much every computer there is a Mac, so you kind of have to I must say I don't like the short version very much. I don't know why, but I seem to be missing a lot more keys than normally and I hear the same problem from other people. At college they also get a lot of abuse, as you could imagine, but most of then seem to stand up to it pretty well. The keys get a little grubby since they're white, sometimes a corner is a bit banged up due to a major impact but all in all, I can't seem to remember any critically damaged. The worst damage they've sustained are the horrible nametags they glued to them which all fell off, leaving nasty remnants of glue. However, please do note that silence of a keyboard is not a big dealbreaker for me and I didn't investigate this extensively. I know they are substantially quieter than normal bigbuttoned keyboards like the one I'm currenty rattling the house up with, but I'm not sure you could call them quiet. I think you should see for yourself. Surely there is an Apple store somewhere in the area where you can go and annoy the staff by going clickety-click for two hours on their fastest rig without buying I'm just pointing you in this direction, you really should find out if it works for you. My biggest personal quarrel with it, however, is that it's white and not black. My setup is (and will even more be) all aluminium (real metal aluminium), lot's of black and a bit of shiney bits of other metals. I am currently trying to work out how I can convert one of these puppies to black without compromising on the durability front of it. Guess it'll be a hell of a job, especially the letters/characters, but hey, all in a modders' life. Now that I've imagined it it's hard to shake it. The Apple Keyboard's low travel is a blessing when you do a lot of typing (like thousands of words a day). It's easy on the wrists, and it allows extreme typing speeds without much effort. Yes, you do have to get used to not raising your fingers so high, but that's a couple of days tops, and it's the same with other low-profile keyboards. It's really quiet. In my experience, it was only topped by the Logitech diNovo for Notebooks (replaced by the K800 now). I wouldn't worry about there being no black one. This by far the best looking keyboard I've ever seen, including high-end competition from Cherry and Logitech. Plus, the white keys show much less wear signs (the glossy polish they get after a while) than black ones. You do have to be careful about making dents in the aluminum—it is a rather soft metal, so don't hit it with hard/sharp objects. Ah, that one looks better. I have arthritis in my hands so an not a typical example, but I definitely prefer a bit of spring. Thinkpad keyboards are perfect for that. Soft so there is little impact and springy with just the right amount of travel. I find that keyboards like the Apple one (e.g. Sony VAIO or some ASUS and Acer high end models) make my fingers feel like they are slamming into the keys, so generally speaking I prefer softer keys with a positive response. I tend to rest my fingers on the keyboard too so too little resistance is also an issue. I do a lot of typing, but it is mixed between general typing like this post and programming which is quite different. When programming you need to use a lot of odd characters and punctuation, as well as doing repetitive tasks and moving the cursor around a lot. Keyboard shortcuts are essential and very often overlooked I feel. Most applications can be sped up with keyboard shortcuts, but the keyboard has to have a good layout for getting to them. I am going to try one of the MS keyboards, either the 600 or maybe the 3000. The 3000 has nicer feeling keys IMHO but the F keys are stupid. Might be able to live with it. The 3000 curves downwards and then upwards slightly like the old Model Ms did which is unusual. I read somewhere that keyboards are basically tilted the wrong way - i.e. from an ergonomic point of view the front should be higher than the back so your wrists are flat assuming you have wrist wrest the same height as the keyboard. Certainly I find laptop keyboards which are generally flat pretty good. I tried a few Logitech ones but was not very happy with the feel of the keys. Find a keyborad like HP that's is pretty quiet. Use hotkeys and stop clicking that mouse. I had a HP keyboard at work, it was okay. Quiet but with a good response. I decided to get a Microsoft 600 keyboard. I had a discount voucher so it was only £5. I was looking at the more expensive 3000 one but the stupid F keys put me off. The 600 has small but properly labelled and grouped (3 lots of 4) F keys and the other keys seem to be identical the the 3000. It doesn't have much in the way of hotkeys (just calculator, play/pause and volume) but I built my own little hotkeys pad so it isn't a big deal for me. The keys have a nice feel to them. Not quite as good at Thinkpad keyboards but excellent for £5. Better than Logitech and many laptops IMHO. I find typing quick and easy. As for quiet... Most of the keys are pretty quiet. Some click though. SPace, backspace, return and a few others do it. Not sure why. It doesn't bother me but anyone looking for 100% silence should check it out first. Presumably the 3000 other related models have the same problem. In summary it is excellent value for money. If I ever see a Thinkpad style keyboard for a reasonable price I will get one but generally speaking the Microsoft 600 keyboard is excellent and good value for money. I made a video on how to quiet a laptop style keyboard considerably. You can find it on Youtube here. I wouldn't recommend trying it on an Apple aluminum keyboard, as the keycap hinges are rather fragile and snap easily. I'm currently typing on a quieted down Kensington Ci73 compact keyboard. I just got an Anyware/AVS W9829BK keyboard and typing on it is even quieter than the Thanko Silent Keyboard, though I know that's not saying much. But it is indeed very quiet for not being a scissor switch board, almost as quiet as my modded Kensington Ci73. Nexus Silent Mouse SM-7000, available in rubberised black and glossy white. I too am surprised there isn't more solid unambiguous info about quiet keyboards. My girlfriends mother needs to record meetings and then write reports on them later. Up to now she's been writing notes with pen & paper and then reconstructing it all working all night to have things ready the next day. It's crazy. If she could type the proceedings in directly she could capture a lot more and it would be a _lot_ less work to prepare the reports and they would be more accurate (which is important since peoples jobs hinge on them). So she got a netbook and a reasonably quiet but generic keyboard and it turned out that the noise was completely distracting to the meetings and was told to stop. I can completely imagine and believe it. I can't believe this kind of stenographer situation hasn't been more exposed as an issue. There must be plenty of situations where you want a keyboard as silent as possible. Customer service not wanting it to be heard by their phone/headset is just one other situation that's already been mentioned besides simply working near sleeping people. In my GF's moms case, recording the audio of the meeting for her to type up later is impractical since the meetings can run 9 hours long (or 9 hour days full of meetings) and the reports need to be ready sometimes the next day, and sometimes there are meetings to record that day too. At least with the handwritten notes she can read those and type them up faster than listening to 9 hours of audio. A silent keyboard really is called for here. I can't find a Thanko for sale anywhere today, and none of these other recommendations are objective. For instance I have one of the apple keyboards and while it's a little quieter than noisy keyboards, it's not particularly quiet. It's louder than the cheap keyboard that was "too loud" for use to record these meetings. So that's frankly a poor suggestion. That was just a cheap junker that came free with an eeebox. That's what's why subjective recommendations are essentially worthless. So I'm just adding to the list of people that DO understand there is a need for this and wish there were objective reviews that list actual db values under some sort of standardized testing conditions. I really don't want to give her one of those crappy floppy silicone membrane things. If someone has tried a lot of keyboards, and similarly has a specific need for silence, and based on that large pool of testing can recommend one that stands out from the rest I'd like to hear it. It may still be a subjective statement but until a reviewer performs tests or until some other manufacturer like thanko posts specs, we have nothing else to go by. those might be handy if you don't want to click on the mouse. Anyone knows how good the mice at quietmouse.com are nowadays? I have a mouse from 3 years ago that is excellent in terms of noise, but it looks like they've changed the model up. I use the Logitech Illuminated Keyboard and find the tonality of it to be very quiet and muted. The space bar is a bit noisier, but not enough to ruin the product. It has illuminated keys (obviously) which goes hand in hand with the quiet requirement and working at night possibly in a dark room. The lighting can be set anywhere from bright to subtle -- it works very well. I purchased a mouse from Quietmouse.com about a year ago. It is excellent with a caveat; With the reasonable pricetag on, there is a concession in terms of flex on the buttons and the scroll wheel, but so far durability has been good with no complaints. It is plastic all around so when removing your fingers from the sides and top of the mouse makes an audible sound(as with any plastic surface). To hear the sound I am talking about just put your finger lightly on any monitor or tv stand and remove it again(really nitpicking here, but some rubber or other noisedampening material on the mouse would be great). It is my first store-bought quiet mouse, so I can't compare it to others, but I'd buy one again if needed without any hesitation. While a bit cheap feeling, Gearhead's $7.50 keyboard from Office Depot is reasonably quiet. And cheap, which is a bonus if you're on a budget. In fact, I may buy another one today, as the only extra keyboards I have are ps2 based. I know that Thanko, Logitech and Microsoft have a quiet mouse and keyboard. Dell has a quiet keyboard, Wacom Bamboo has s quiet mouse...I am not sure which is the better choice, though. But it is nice to not have any noise on the scrolly wheel being that there isn't one. It's hard to believe people actually want the crappy rubber silicone membrane keyboards. The noise of typing on a mechanical keyboard is actually satisfying in my opinion. But only when I'm the one typing. I do hate when someone is typing on a loud keyboard in the same room as me and I'm doing something else. I use the Steelseries 6gv2 with cherry mx red switches. Great keyboard thing is built like a tank. Expect it to last me 15-20 years. And I wouldn't even say it's THAT loud, there are louder keyboards for sure. I had a pretty quiet dell keyboard many years ago. It was a beige keyboard and it had the words Dell quitekey in grey in the top left corner. It still wasn't perfectly dead silent, I don't think it's possible to make a keyboard totally inaudible unless you type very slow and carefully which is a huge productivity waste. I've gone through many mice and never come across one that was inaudible. Don't think that exists either. I have to use a logitech performance mx because it's the only mouse that works on clear glass my desk has a glass top and I hate using mouse pads. It's hard to believe people actually want the crappy rubber silicone membrane keyboards. Big difference in price, and for anyone willing to fork out that extra money, you still have to convince them of the benefits of a mech keyboard. Just have to link them to the OCN Mech Keyboard Guide. I can also vouch for the Logitech Illuminated keyboard, although the wired version has been EOL for some time now. If you can get your hands on a second hand board that's still in good condition, be sure to jump on it. I've got one of them stashed away as my spare keyboard. The noise of typing on a mechanical keyboard is actually satisfying in my opinion. But only when I'm the one typing. I do hate when someone is typing on a loud keyboard in the same room as me and I'm doing something else. I use the Steelseries 6gv2 with cherry mx red switches. Great keyboard thing is built like a tank. Expect it to last me 15-20 years. They slightly exaggerate the click of the normal mouse, and are a bit too gentle clicking with the JSCO mouse, but it still gives you an idea of what it sounds like. I'm on my third one now, as the other two have broken over time. Still managed to get about 12 months out of each of them, and they're only $30 USD/AUD including postage, so they're cheap enough to forgive the mediocre quality. Besides, I'm not aware of any decent alternatives. The Nexus SM-8000 and similar Nexus SM series mice are the next best option, especially if you're after a wireless mouse. I'm heavily limited in mice, Logitech's darkfield tech for working on clear glass does not exist anywhere else. But yea there is nothing like the solid feel of a mechanical keyboard and they basically last forever. My keyboard's key presses will feel the same 10 years from now as they do today. It's well worth the 100 dollars for a mechanical keyboard. Who cares if they make more noise they feel so sturdy and solid the keys don't wiggle at all it's pure heaven to type on them. What do you think of the custom laser engraved keycaps you can get? I'm tempted to get some. Just a novelty thing. I love the look of them, but the price (postage cost as well) always keeps me in check. Now a full set of high quality PBT keycaps? That I could go for, but I prefer my LED backlit keyboard. So until someone works out how to make PBT keycaps that let LED light glow through the lettering, I'll have to stick with my stock ABS plastic caps. Hopefully one day it'll be done. I have now been using a cherry stream XT model G230, part G85-23100EU-2/00) and I'm very happy with it, there is just a bit of higher-pitched noise that you can already hear if you wipe your hand softly over the keys, so I think it's from the way the keys are mounted, some tolerance on the keys probably.